People are wary of advertising. It’s easy to fast-forward through commercials, skim past print ads, and block pop-ups. But what if there was a way to bypass the obstacles of traditional sale funnels? Content marketing is the thoughtful exchange of information between a clearly defined audience and a brand– with the objective of engaging and encouraging them to take action. Consumers want strong content that helps them perform faster and smarter, or provides unique insight. A solid content marketing plan demonstrates knowledge and product while encouraging engagement, but also requires an editorial plan, writers, research, money, a distribution strategy, and time. It’s a successful strategy. (Infographic for numbers? 70% of consumers prefer to get to know a company through original articles produced by the company. Consumers perceive branded content as being more consumer-centric because it is less about selling products and more about providing value to consumers. 78% percent of chief marketing officers believe that custom content is the future in marketing. 56% of marketers believe that personalized content promotes higher engagement rates, according to an IBM Digital Experience Survey. Content marketing is cheaper than traditional marketing yet generates almost three times as many leads. Customers who receive custom content via email newsletters spend 82% more when they buy from the company who sends them. 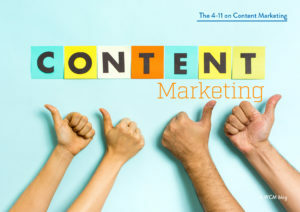 44 percent of B2B companies outsource content marketing work. They brainstorm and work with custom publishers who do the research, writing, design, editing, production, programming, and distribution to create a final product for prospective clients. It can be a magazine, an email newsletter, website, blog, social media messaging plan, or a combination of all of the above. Offering your customers thoughtful content provides a resource that helps them make smart decisions about your brand and the overall market. This engagement turns content producers into valued leaders and influencers. Content marketing is about more than return on investment. It’s building brand loyalty so that your consumers choose you every. For more information on content marketing, take a look at The Anatomy of Content Marketing infographic created by Content Plus.